CBSE Private Candidate Admission|Practicals|Admit Card|Result - padhaee "
CBSE Private Candidate Admission|Practical exam|Admit Card|Result – For all female students hoping to appear as a CBSE Private Candidate here are some VERY IMPORTANT and useful tips that you need to go through. Note, this post is written by a CBSE Private Candidate herself, so you wont find this information anywhere else on the web. 2) Through CBSE Patrachar School, not only a Females but also Male students can apply . 4) Private candidates cannot change subjects or choose subjects other then their old school was teaching .Eg. Maths , Science, Social Science, English communicative /Literature , Hindi /Sanskrit. 5) You are not allowed more then 5 subjects. Also practical exam/ examination not allowed to be chosen either. 6) W/o Practical exam subjects like Science aren’t of 100 marks Theory, But 80 Marks. You must score 25 marks, minimum for your 80 marks subjects, and for the rest of the subjects, minimum score should be 33 . 7) Private women candidates need not join any regular school nor Patrachar Schooling. She can study at home. 8) No need to fill form through any institute, personal tutors, coaching center etc. As you going to end up paying higher fees then CBSE PRIVATE FEES. Total Fees is below RS. 1000 max . 11) With form You need to summit Your Transfer Certificate, Last clearing class marks sheet xerox copy, and an AFFIDAVIT attested by First Class Magistrate/Notary (Details of affidavit are given on your forms ). 12) Only Candidate below 18 yrs are required to submit Affidavit, Older than 18 yrs old need to submit any affidavit. ( only those women National territory of Delhi appearing as fresh candidate ,without having read in any recognized school. 13) Form should be only filled with Blue/Black Ink. Do not fill with Glitter(sparkle ) Pen. There shouldn’t be any cutting or fluid used on your forms . Fill with concentration and slowly need to not show any hurry and Spoil your form. 14) After submitting your Form do not forget to receive your form receipt from bank. Receipt can be use if case of not receiving your admit card letter. 15) Do not come under any scams running by Private Institutes/Coaching Center claiming 100% clearances in 2 months,3 months or less. 16) Must sign your full name in signature column do not sign differently in your examination hall. Required 1 passport size recent photograph for submitting with form. 17) Roll no. and admit card info with your examination center name/no. will be provided in month of February. All students must visit there given Center and receive their Admit card . (With only CBSE letter OR without Admit card students wont be allowed to attend examination). 18) Finally forms must be signed and stamped by School Principal or recognized Delhi school . 1) Student must have one year gab between 10 th standard passing year to applying for 12th standard Examination. Eg. If Student has passed there 10th Std in 2014 can apply for 2016 12th Examination but not for 2015 Examination. 3) Required to submit class 10 passing marksheet ( not allowed if candidate not Qualified 10 th standard). 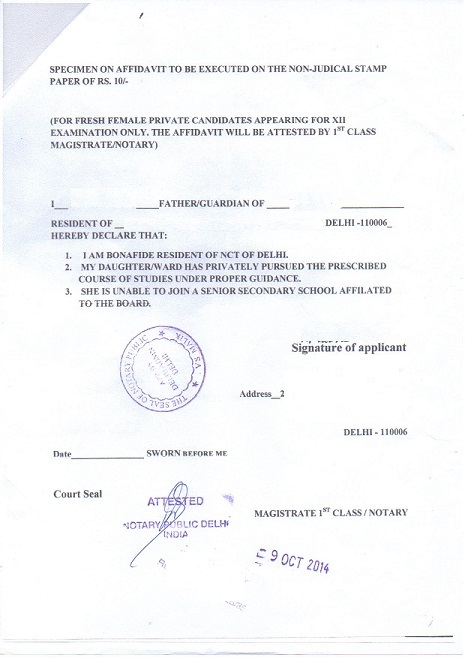 4) Only National Territory Of Delhi’s residing Female candidate can apply for private examination.Male candidate has to apply through CBSE Patrachar School as this is the only way a male private candidate can apply. 5) Male candidate can join NIOS also. 6) Candidate will be examined only in the syllabus as prescribed for the year of Examination. 7) Don’t apply for any stream you are not confident of passing just because it is suggested by your relatives, Parents, Tutors etc. Apply for only those you are confident with it. 8) Examination MAIN held in month of march only in case you had taken 6 subjects and passed in 5 out of 6 you will be declared Passed. 9) Compartment candidate has the option to retain there previous practical exam marks of the first year Examination. 10) CBSE forms cannot be applied or downloaded online . Can only be collected at selected Syndicate Banks. 11) CBSE regional office does not supply examination forms . Can only be collected and submit at SYNDICATE BANK only. ha de sakte ho but still better speak to cbse first for better idea. Mam/Sir main cbse 10 mein compartmental aaya hai aage ja ke koye dikhet . hii mam !! i have a doubt ..
but i want to repet by giving private exam ..
am i eligible to give the private exam ?? it is said that only failed students can give private exam …is it true ?? Mam maine july 2018 me compartment class12 ka exam diya tha but clear nahi ho paya kya main aab 2018 me next compartment na deke sare subjects me appear ho sakta hu ..aur kya mere practicle k marks carry kar liye jayenge pahle wala…..
Hello Mam,i was failed in 2017 board,I appeared from private candidate and scored 60% only,can I appeared in improvement exam next year?can I eligible for jee advance? Please tell me Mam……..
call cbse office for better response. since ur 5 attempts are over! Kon sa 5 Attempt.only attempt????? mera comptt exam ki date nikal gyi h to kya 2019 k lie comptt bhr skta hoo only one subject ka last year bhi m comptt m pass nhi ho paya tha to kya is year bhi m bhr skta hoo plzz reply its very imp. ha de sakte ho . if I choose any 6 subject like computer ICT should i also give practicals other than theory. Tc and character certificate private candidate ka kaise milega. TC kyun milega private main toh koi school hi nhi hota jo TC milega! better enquire with cbse office since your 5 attempts are over! Ma’am…jin students ne private form daal kr exam diya ho unko unki 12th ki marksheet kahan se milti h???? but mam private candidate ka marksheet speed post se aata h na…?? Its same like regular . Just study well . Ma’am private candidates ko unka result kahan milta h? Apply as private candidate for 10th std . There isnt any Practical . Economics w/o pr means Economics without practical . CBSE evaluate answer sheet for the same and give average marks depending on your theory exams. Mem mera putra kv ka chhatra hai aur waha class 11 commerce me 1 subject Accountancy me fail ho gaya hai. Kya use academic year 2018-19 me class 12 me admission milega mai Gwalior MP me rahe raha hu to yaha par kis jagaha jana hoga admission karwane ke liye please reply me soon I m very confused. 12th main admission miljayega . Kaha se milega uska mughe knowledge nhi MP KA. Hello mam mene 2018 me private candidate se economics ka exam diya kuki 2017 me only economics me fail thi. But 2017 me economics ka pratical nhi hota tha but is year se start hogya he or exam 80 marks aya he to mam hume pratical marks kese milenge or private candidate ko dena pdega phele me regular thi.or exam leak hogya h jo fir se hoga.pls tell me about economics pratical for private candidate muje kahi se information nhi mil rahi h centre se bhi nahi. You will get marks as in average marks from your theory examamination only! Appear as fresh candidate for next year. Without seeing your result dont predict anything. Agar examiner bol rahe hai then must be true. If your fellow students saying then confirm with examiners. I think you have to pass 10th cbse first. I’m not sure but! Pratical markd retain hojate hai. Private candidates ke practical nhi hote. If you had added your previous year practical subject examination roll no. in your admission form ,then you dont. Else you need to give practical again ! Final marksheet laker jana. Confidence se interview do waha koi nhi dekhta ki ek attempt main clear kiya tha ya 5attempt. Hello there, Ms. Jain, can you kindly furnish me with your mobile number? I’ll wager that my motive isn’t being a sham. It’s utterly essential and related to your post; but quite rigmarole in its nature, so, if it’s expedient, I would request you to drop your number. I could also provide mine if you wish. mam ye centre supdt may kiske signature honge?? result se pahle predict met kero . Don’t stress yourself so much mid of examination. Don’t worry all will be good ! Call CBSE office and figure out! Ma’am, I failed in my 1st attempt of CBSE in 2017 regular candidate. Then I think I’ll fail again this year 2018 as private candidate. Can I give CBSE boards third time as a private candidate in 2019? I’m in class 12. Please reply ma’am. hi, yes you can . you need to apply as fresh candidate. I was absent for 2017 class 12 TheoryExams. I gave the practicals though. The result that flashed on the screen was “absent”. I appeared as a private candidate this year in 2018 under the “failed” category. My practical marks were retained. I will for sure this year in Physics and Chem. I want to appear again next year as a private candidate. Will my practical marks be retained again ? Yes, technically, this is my second year as failed candidate,but I was absent last year and this was the first time class 12 I faced the boards. Will my practical marks for Phy,Chem and Comp Sci be carried over for next year If I want to reappear as a private candidate ? PLEASE reply Mam. Will be grateful to you. I was absent for 2017 class 12 TheoryExams. I gave the practicals though. The result that flashed on the screen was “absent”. I appeared as a private candidate this year in 2018 under the “failed” category. My practical marks were retained. I will for sure FAIL this year in Physics and Chem. I want to appear again next year as a private candidate. Will my practical marks be retained again ? Yes, technically, this is my second year as “failed” candidate,but I was absent last year and this was the first time class 12 I faced the boards. Will my practical marks for Phy,Chem and Comp Sci be carried over for next year 2019 If I want to reappear as a private candidate ? PLEASE reply Mam. Will be grateful to you. I will make it a little clearer mam.Sorry. BUT PLEASE do reply. Zindagi ka sawaal hai. 2017 : I gave my Class 12 Practicals in -Phy,Chem,Comp Science. But I didnt appear for the theory exams in 2017 due to illness.I was absent for 2017 class 12 Theory Exams. I gave the practicals though. The result that flashed on the screen was “absent”. 2018 : I appeared as a private candidate this year in 2018 under the “failed” category. My practical marks were retained. But I will FOR SURE FAIL in Physics and Chemistry this year in 2018. I want to appear again next year in 2019 as a private candidate. Will my practical marks be retained again ? I want to appear again next year in 2019 as a private candidate. Will my practical marks be retained again ? ALSO CAN I APPEAR FOR ALL SUBJECTS OR ONLY FAILED SUBJECTS ? PLEASE REPLY MAM. PLEASE.Zindagi ka sawaal hai. Why next year. If only failed in science. Then reappear for improvement exams held in july-august. Since CBSE give 5 tries for each candidates including absence. Try to appear for JULY-AUGUST EXAMINATION. AND YOUR RESULT AINT OUT YET DONT PREDICT SO MUCH NO NEED TO STRESS YOURSELF SO MUCH ALSO. These are only board exams wont decide your entire life. Nahi mam. I didnt pass out yet, so I cant give improvement exams. Waise, compartment exams are only for one subject, and I will fail in two subjects. I wanna give them again next year. Will my practical exams be carried over for 2019 ? Also can I appear again for all subjects again, with practicals carried over ? 1) Will my practical exams be carried over for 2019 though I had given the practicals way back in 2017 ?? 2) Can I appear for all 5 subjects including Phy ,chem and math (practical subjects) in 2019 ? Mam,science is only one subject for class 10. I am talking about class 12 , Phy and Chem are two different subjects. I can give compt exam only for one subject. Either way, I wanna appear again next year in 2019 if its possible ? I have only two queries and CBSE people are not replying to my email queries. 1) Am I eligible to reappear as a private candidate for 2019 ? 2) Will my practical exams be carried over for 2019 though I had given the practicals way back in 2017 ?? 3) Can I appear for all 5 subjects including Phy ,chem and CS (practical subjects) in 2019 along with eng and math ? Mam, assume I failed in 2 or 3 that is multiple subjects. Then I am not eligible to write the Compt because can write the compt only for one subject as per CBSE rules and guidelines. Now my Queries are 1) Am I eligible for 2019 as a private candidate? 2) Will my Practicals marks of 2017 be carried over to 2019 ? 3) Can I rewrite all 5 subjects or only those which I flunked ? PLEASE reply mam. Dont stress yourself soo much dear . Give me your subject codes so i know your case better ! 2) Will my Practicals marks of 2017 be carried over to 2019 ? 3) Can I rewrite all 5 subjects or only those which I flunked ? PLEASE reply mam. Yes you can reapear for all subjects if you want to. Practical marks should carry forward according to me . For better assistance visit cbse office! God bless you.Please pray for me too. Does this say the same too ? You can for examination 2019 not before , unfortunately . According to CBSE rules 1 year gap is a must ! I have not cleared my compartment exam in 1st chance in economics. And i have fill the compartment form as private candidat. They will carry forward your previous practical marks . Since its the improvement examination ! .I will give my exam in (2018)as private candidate…bt i don’t get my praticals date…my praticals will be taken or not. there rnt any for private! So can u please explain me the procedure of this practicals. Ma’am can you just tell me the procedure of home science’s practical. Sorry no idea about home science ! Better contact CBSE office or other students of the same subject! practicals rnt for private candidates. You will get average marks of practicals , depending on your theoretical exam! i am a private candidate i applied the form online should i get my admit card by post or have to download it and how to get Centre Supdt. and stamp on the admit card if i take a print out. contact your regional CBSE office, because in Delhi , male candidate can not apply as private candidate! Mam I was passed class 12th in 2014 now I want to improve my marks is there any possible way to improve my marks please tell me. in my knowledge its not possible , since you had crossed your span period. check on ncert website for books. Or amazon ya flipkart per dekho waha hogi! I dont have any info about home science ! Mam mein..12 class mai fail ho gya tha…ab maine private form bhara h iss shaal to practicals ke pichle shaal ke marks add ho jaynge ki dobara dene honge..
ha hojange , agar tumne details form main add keri hogi toh. In my knowledge ,Private Candidates dont have practical exams . Mam,i got compartment but instead of giving compartment I rejoined in the same institute so my question is that do anyhow I have to give practical exam? Yes , you have to ! There arnt any project work for CBSE Private . average nikal ker laga dainge ! practicals nhi hotey , private walo ke. Mam mera economoics me compartment aaya hai aur ab 2017-18 me practical bhi aa gye hai economocs me toh meko apna practical file kaha jama krna hoga aur me regular students tha…toh mam plss help me where i have to submit my practical files..
You can submit at your examination center only! 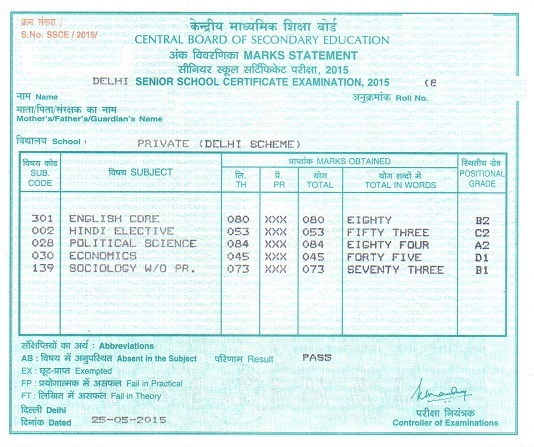 go to CBSE and collect your matricular certificate and final marksheet ! Mam i am in class 12th from bihar don’t want to give 12th board this year (2018).so can i appear as a private candidate .if yes then from where i have to give my practical exams pls help ……no body helping me!!!!! go to cbse patrachar of ur region . Else dont skip your year . because boys not allowed to appear as private candidate. How can you send without payment recipt? Submission time bank do check that while submitting . Either visit CBSE Regional office with your query . Since your fees slip has your application no. And if still fails then reapply ! i completed class 11 in a regular school. would i able to appear as a private candidate in class 12? if yes, will i be able to change my stream? Yes, you can appear as private candidate in Class 12th ! either you reappear as a Fresher candidate or go for Maths Improvement Examination. Sakshi , What i’ve told you earlier is with my own experience, If still you aren’t satisfied then can’t help you further ! Go for those you are failed only ! Ma’am form konsi site pe nikli hai. Cbse ki site pe toh nahi aayi abhi tak unse maine pucha bhi tha vo keh rahe the ki November tak aajayegi. Now what can i do please help. When will private form release for 12th??? already out . See if you can still apply with late fees . Hello ma’am next year I’m going to give exam as a private candidate but the problem is can previous year I had 6 subjects I want to make it 5….is it possible? ?? Depend if you filing fresh form , also on your stream. I was a regular candidate in rajasthan, kota for cbse 2017 12th board. But im from siliguri, west bengal and I want to take my improvements from WB. I wish to take up all the subjects but as a private candidate since I will not be admitted to my previous school. My goal is to get admitted with a scholarship in an american college so will being a private candidate for inprovement 2018 be a problem? Is this improvement exam safe for getting admission normally anywhere? Does CBSE provide information about the student being eligible for college admission almost anywhere around the world as a 12th graduate just like she/he would be as if he were graduating as a normal 12th graduate? Its better for you to apply for all subjects again beside going for improvement . Percentage will get affected that way. And better apply Private from affiliated CBSE School because like it was in my case i wasn’t allow to go with Practicals which do affect percentage . For college admission criteria you need to check each College Prospectus separately. Since each College has its own admission Percentage..
Hello mam..where do I get the forms for private candidate for class 12..I’m residing at kolkata..I called the patrachar vidyalaya in Delhi, they said that this is only for the Delhi candidates who are residing at Delhi..so I asked where do I get the forms for private candidates..they refused and didn’t answer my questions!! And patrachar vidyalaya is only situated in Delhi no where else. What should I do mam? This is very important for me mam..plz help..I’m already stuck in the middle of it. Visit your regional CBSE office if there is some other way out. to my knowledge , there isnt any projects submission system for private. Should be out now. Check with your CBSE regional office if delayed this much. Hello Ma’am, I have passed 12th PCB in 2016 itself. I want to give only Mathematics exam in 2018 to be eligible for competitive exams. Am I eligible to take part as a private candidature for a single subject? Will it be added in my previous mark sheet? Ma’am when will the forms be out? Ma’am cbse site pe nahi aaya abhi tak please help me. Also is it possible to get admission in Delhi University after scoring 90 above as a private student? Yes . There isnt any issue. I am planning to take CBSE Improvement Exam as a Private Candidate. Will I be able to get into DU? Yes i’m sure. Rest depend on your performance. I give compartment exam 2017 Maths has a reqular students but compartment doesn’t clear Can I give recompartment next year if yes then when will then form came out and document required for next year compartment exam is transfer certificate is necessary. Yes , you need Transfer Certificate and rest of other documents mention in my article except affidavit . Hey forms might be out now most probably . Check at Syndicate bank. sherya CBSE isn’t and can not be partial towards marking. Since there is no where mention on your marksheet if you are a private candidate or regular, there aren’t any chances of partiality either . Your Practicals will be held most probably at Patrachar centers else they will help at your examination center. Practicals dates will be given to you by Patrachar or CBSE accordingly . What are the procedures for it who are living in out of Delhi..am living in kolkata..will you please help!! I have appear cbse12 compartment exam 2017 as private candidate i have pass but still cannot admission to college without migration certificate where should i get my original migration certificate? CBSE office of your region. I was faiI in chemistry and maths so i got a compartment in main results by the help of physical education in may but in compartment I cleared it so my math has gone in additional subject and I want to do technical courses in which pcm is must…..
Is CBSE patrachar is right way to go for because it will give result of CBSE same as regular students or private candidate. According to CBSE rules subject with lowest marks is your sixth subject . In your case you need to re appear for your Maths Subject to gain higher marks then your lowest one. Patrachar is CBSE Private school just a way to attend CBSE Examination as Private Candidate. A way to escape from regular schooling ! it just a way to apply for Private Examination . Else why dont you apply through CBSE affiliated school as a Private Candidate. Unfortunately for male candidates CBSE not keeping many Private Examination options . Either go for Patrachar CBSE or CBSE affiliated school for private examination . Both are samethings. I want to start homeschooling for my son who is in 7th standard in a CBSE school in Mumbai now? Can he appear his 10th privately? he need to attend at least 8th standard . For homeschooling, for now can admit your son in any CBSE affiliated school as Private Student. I have passed 12 in 2016 but now I want to give private exam for good marks in 2018 exam…..Am I eligible to fill private form??? Yes you are But be careful if case you didnt done well in march 2018 , then July 2018 Examination going to be your last chance . Hey CBSE gives 5 chances to Pass. Doesn’t matter if you had attended examination during your span period or no . Unfortunately you have to reappear for all subjects for next year. Since yor are male student you can apply through CBSE Patrachar of your region or through any CBSE Affiliated school as Private Candidate.. I have compartment in my 12 standard in 2016 but I tried NXT year as a private Candidate I have clear all my exam I got my marksheet through post but don’t get migration then what to do???? hii i got compartment in economics last year in 1st attempt i did n’t cleared in second attempt i was now private candidate and i got cleared soo now while filling du sol where i have to verify my marks i have to provide my roll no. now i got 2 different roll no. and checking from both it was not verifying what can i do mam please help!!!!!! I have passed 12 th in this year(2017),but i am not satisfied with my marks,can i repeat 12 th class, because i want to go to du? Plz help? From where i get the character certificate and migration? From your CBSE regional center. If you arnt from delhi then you need migration certificate first . Then visit patrachar school for private candidate admission . As per delhi private scheme only female delhi candidate can apply direct to cbse private. And for male candidate apply through patrachar or any cbse affilated school. I have 4 year gap .. I had failed in 2014 . Now I want to apply for senior secondary . So can I do that whats the process. Yes you can continue. You can apply as private Candidate! What is the fees for private candidates? Where do I find patrachar vidyalaya in kolkata? And from where do I get the admission form for private candidates? Call Patrachar number its there on there website . You will get form from Patrachar only! Yes, You can get your migration Certificate from CBSE Regional Branch . What are the steps for admission in cbse private? hello mam for private candidate where they will get there migration , passing certificate ? Hi Akash sorry for being too late. I would like to know first when u had given ur maths compartment exam last , and how many times so far ! Can you give me brief details . I’m not getting what you are trying to ask . Apply maths for march 2018 exams . If you want to improve all subjects marks then reappear for all exams without mentioning your past scoring or attempt. And Will my Old practicals marks will be carried on in the new marksheet? I passed in practicals and failed in maths. No . You have to attend everything again including Practicals . Hi, Harshit for male Candidates CBSE don’t allow direct Private admissions. There are few ways out which let you apply for CBSE Private candidate . 1. You need to visit any CBSE affiliated school and enquire them about Private Candidate procedure. 2. You need to visit your regions CBSE Patrachar center and take the admission through them . Hello mam, I’m a student of 2013 batch. And I’m having a compartmental subject which I did not clear at that time in class 12 examination. And now i want to give the whole exam again (all subjects). Now I just wanted to know that will I be eligible for taking up the admission as a private candidate in cbse? Hi, Indranil Roy .. YEs, you are eligible! Visit your Examination Center for that . Where you had given your mathematics exam! Go to exam center to collect your marksheet and Passing certificate . Can i appear as a private candidate if i had taken TC, and other stuffs from school (CBSE) ,since i was not successful in BCA entrance. And i only want to opt in my interest field…plzz reply as soon as possible. Hi, i think you can for better information visit your regional CBSE office . Depend on what Course you are going for it . And exactly how much percentage earned. ??? Wht’s your Stream and How much you were expecting ? Well if you think your marks are incorrect then ask for re-evaluation from CBSE board. i am passed in all subject in 12th senior secondary examination in this year(2017)……but i want to reapper in examination in some subject such as a private candidate..how can i do???? ?..please suggest me mam….. If you are from Delhi, then go to any of syndicate bank Branches listed by CBSE and ask them CBSE improvement form . And remember one thing once you reappear for any subject and score lower then your current result then you wont be able reverse your scores . 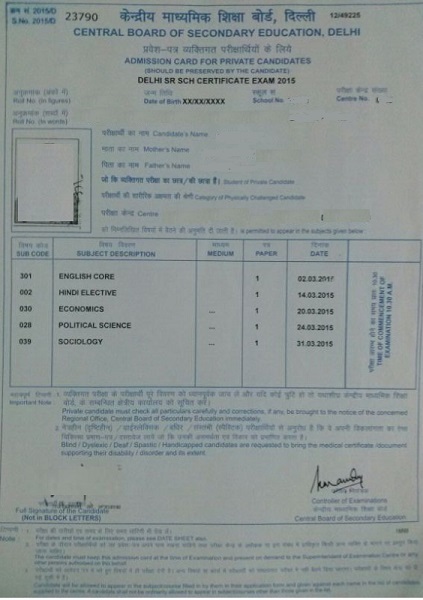 Marksheet and Passing Certificate! As you had attempted all subjects again your 2014 attempt wont count . To my knowledge private candidate only get Theory marks . Latest marksheet is always the main marksheet . Regarding migration certificate please confirm from CBSE office New Delhi . This year I was a private candidate for CBSE class 12th?,I had fail in theory of chemistry. Apply for improvement in chemistry for july – august exam. Mam i have given cbse 2017(improvement) exam this year as a private candidate. I want to know that how i will get my marksheet. Is it sent by post or we have to collect it at regional office or exam centre. value is as good as of regular CBSE . I think! There is one way out but its darn risky SO think properly before going forward . You need to apply for 12th board again without mentioning your previous marksheet. Otherway is fill form for particular subjects in which your marks are less. CBSE allow five chances for improvements , including your gap years. 1.Is cbse patrachar same as regular? 2. What about practical exams cause I have heard they don’t add your practical marks most of the time? 3.Dose your student get good marks like 90 and above in 12th? Its of same value as examination conduct by CBSE not Patrachar school. Patrachar is only your medium to apply for CBSE private. Regarding marks thats depand on your prepration and the way you attend your examination nothing to do anything with patrachar etc . I want to study science but don’t now how to do practical what can I do plz help. For Private Candidates Practicals not allowed . Better go through Some Private Cbse Affliated school as a Private Candidate! CBSE evaluate your marks according to theory average . yes practical marks are lollipop marks . IF you not confident about patrachar then go to any Private CBSE school and ask there private candidate procedure . Mam recently i failed in cbse class 12th.so i want to ask one thing that if i take admission in private cbse candidate,so it will better for me or not.and one thing it has value for taking admission in better colleges, further studies and for jobs also plzz tell me mam? Marking Criteria and value is same as regular Candidate. But to my knowledge Private Candidates not allowed to go for Practical examination . I suggest you repeat your 12th from school only as this way you wont lose your Practical marks which makes big difference in your final result . Can I retain my previous 12th yr practical marks? Mam another que. Is that exams r fficulty level for private cans date is as same as for regular student? Pratical marks only retain when fillig for Immprovement . Yes Same difficulty level ! Mam please will you tell me the proper proper process to apply for CBSE 12xam as a private candidate for male?? And also tell me about CBSE patrachar?? Call cbse office and enquire regarding TC there . CBSE patrachar is a private school for non regular students especially for boys as CBSE do not allow priavte male candidates to apply directly . Other way which is way better then patrachar also go to Cbse affilated private school and ask there private candidate procedure . OUR NEPHEW FAILED IN 11 ARTS CBSE NOW SHE WANTS TO GIVE DIRECT 12 TH PRIVATE EXAM. HOW SHE APPLIES WHAT FORMALITIES REQUIRED AND WHETHER CHANGE OF SCHOOL REQUIRED. Dear Kirti . Your niece will be require School Leaving Certificate and 10th std marksheet. You can get CBSE Priavte form from list of syndicate bank mention at cbse site according to your location . Which should be available from mid of August month. Can a female candidate join nios as well? Yes female can also apply for nios 🙂 ! go to cbse and confirm there . As per my knowledge you can go for patrachar after cancelling your nios or best do not mention about your nios admission there. How many time you had given immprovement examination ? If 5 times not over yet file again for immprovement . Without Clearing all examination you wont be declare PASSED. I have failed in class 11 will I get admission in 12 private? From your exam center . if will be same as of last year or new result or we ll get combined marksheet or we get failed…..?? i hv filled for english,maths,physics…. Whatever will be your improvement result it is going to be yours result for these subjects . 2. .or, can we take the signature of the Centre Superindent on Admit card, on the day of the examination? 3. And, is the Centre superintendent same as the Principal of the School where the exam is held? You need to visit before examination. hello mam …i am appearing for improvemrnt exam in all subjects. what should i fillup in bhu entance form as passed or appearing ? To my knowledge, Untill you dont have your final marksheet you arent passed. Call CBSE and enquire there. Means in case candidate has any physical disabilities . Thats ok .Avoid it else visit Cbse Office and enquire there . hlw.mam im anjana pradhan from sikkim i have passed my examination on july 2016 but yet i din”t received my pass certificate…i had inform to department but they told me that they will send trough mail(post office) but i dint got yet… plz help me n give some idea………. You are suppose to collect from your examination center . You can go to your nearest cbse patrachar center along with your 10th std marksheeet . Hello. I’m in 12 science and I don’t think I’m gonna pass this year with good percentage due to some reasons thus I wanna reappear next year. Is it necessary to fail this year (intentionally in any two subjects) to reappear in 2018? Hi! Misbah No you dont need to get fail for score improvements. As you can next year repear any subject you want to improve. DO NOT RUIN YOUR EXAM THIS YEAR INTENTIONALLY . MOST IMPORTANTLY RIGHT NOW FOCUS ON YOUR EXAMS NO MATTER . REPEAR IDEA CAN BE DELAY FOR SOMETIME DEAR .YOU Never know you might score good in shot also. (TIPS for this year exams keep practicing last 3 years question banks ) . How marks for practicals are added for patrachar students. Its same as for regular candidates. I got failed in my exam at patrachar vidyalaya ..and I had science stream … I want to ask ..I have history .. physical edu. And sociology as my new subject…..kya me inke practical exam deskta hu… And agr nhi toh ..how are my marks in these subject going to be assesed?? I’m not really sure how patrachar function in such case sorry . Agar practical nhi day sakte toh marks Theory exam result ki average nikal ker diye jate hai. There isnt any first or second term dear . Straight Annual Exams their ! I will suggest Patrachar as It is same as of CBSE Regular. Patrachar only a medium to appear as private . Way of examination is same like regular candidates. date toh gayi ab try filling form with late fees . CBSE 10TH Private rules, marking system is same as for regular students . Fill offline form then ! Mam me 12th class me fail ho gya. To me private form bharne jaa rha hn online . To mam mujhe allhabad region se bhubaneswar region transfer karani ha . Wo kaise karu . Pls mam reply fast. T.C. is important dear it will be required surely and for payment you need to visit affiliated syndicate bank of your region . I’m not sure about debit card payment you can pay by cash or cheque . Miss priti! Good afternoon. Today i have a enquiry about the Private Candidates Exam of class 12. Year 2017. Last year i failed my exam but this year i really want to pass out my exam for the further study. So, private candidate can select the exam centre or transfer to another centre….? It is possible or not. Hi Vimal yes you can apply private in 2017 but through PATRACHAR CBSE or else private candidate from some school. CBSE do not allow male candidates for private examination directly . Regarding your Practical Marks its better you consult at Patrachar office for best reference . I am himanshu. I have passed my 11th in session 2015-2016 with science. Now i am doing same in class 12th.but now i want to change my strem. Can it be possible. Can i change ny stream. Now. Mam I have failed in my 12th exam..if I do 12th with private..is It would be good for my further studies…?? Hi Priya! Its ok If you failed Private is as good as from schooling Dear not to worry . As its CBSE in the End . .
maine 2016 mai 12th k exam diye, but unfortunately i was fail in 1 subject, than i drop mine compartment exam. and decided to fill cbse private form . Is i’m eligible for it to fill form for cbse private exam in 2017, plz help me its argent. Hi Jay Singh Yes you are eligible to re-exam in 2017 . And as you are a male candidate kindly assure from CBSE in case you are allowed . As per my knowledge only Female Private Candidates are allowed . I failed class 12th in 2015. Given 2016 class 12th board exam has private candidate, but got compartment in one subject. Again, got compartment in 1st compartment. Can I appear again as a private candidate in 2017 with same practical marks as in 2015?? Sambit You can Appear in 2017 Examination with your same practical marks . AS per my knowledge CBSE gives you 5 chances to clear your compartment. Manisha Pahle aap please CBSE call kerke pata ker lijiye ki apka Brother Private CBSE ke liye eligible hai ya nhi . Jaha tak mughe malum hai CBSE PRIVATE sirf girls ko hi allow kerta hai . Agar apka Bro kise school se private kerna chahta hai toh woh Possible hoga . And Last Option apke Brother ko CBSE PATRACHAR se ker sakta hai. Aap waha Cbse patrachar main jaker pata kijiye woh sab details denge! mein agar as a private candidate apply karta hu aur phy,che,and bio with practical leta hu to kya mujhe doobara practical file taiyaar karni padegi . Aur jab mein practical dene jaunga to kya mujhe practical doobara likhne padenge agar ha to mujhe pta kaise chalenge ki kaun se practical aayenge school mein to teacher hint de diya karte hai but ab kya karu please meri help karo private exams ke form aane se pehle. Hi Ajay sorry for late reply . As far as i know there isnt practical system for private Candidate . And please figure out properly from CBSE PRIVATE FOR BOYS is even there . To my knowledge CBSE doesnt have private examination system for boys. hii i am amit and mam meri 12th mei ek sub mei compartment aayi thee aur mai second attempt mei bhi compatment aayi thee soo 2016 mei mera ek sub ka form as a private candidate aur re registration ki wajah se mere roll no bhi change ho gaye and then ab maine paas kr li hai to school se mujhe 2015 ka migration,2015 ka character aur 2015 and 2016 ka result mila hai but tc nhi mili bec unhonekha ki 12th 2015 compatment ki tc chalegi nhi aur 2016mei private candidate hone ki wajah se tc wo de nhi rehe so can i take addmission in du sol. Yes you can take admission in SOL. And TC isnt required for SOL admission so dont worry about it . You will need Passing certificate with 12th marksheet and 10th marksheet with matriculation certificate. Infact your marksheets are good enough . Dont worry SOL mein admission aram se miljayega . Its upto your total percentage jo sol form mein 10 and 12th ka roll no dalte hi auto show hojayagi. I want to inquire about my maid who is studying in class 6th but 16 years old. So, can she some how directly appear for the 8th standard CBSE exam if I prepare her for that? Please suggest! Hello, i have graduated from class 12th in 2015, i was supposed to do improvement exam in 2016… Which is now but i didn’t know about it. So I didn’t do it. And i got a low percentage which my country doesn’t accept me in any college. So i asked to do improvement exam in 2017, they said its not allowed… So i want to appear as a private exam for three subjects? Is that possible in 2017? Please reply?? Hi, Lisa ! from where you did your 12th graduated ? Gurudas you will get marksheet of board exams out of 100 only . Online results r just for your convenient until printed marksheet isnt issue by the CBSE BOARD. By the time you can print your online result for applying further admission and so on . I have taken humanities and I’m concerned about my history, pol sci and sociology projects . I mean where am I supposed to submit them or I don’t need to write my projects since I’m a private candidate (fresh female) pls tell! Hi Mansi as you are private candidate you dont need to submit any project/practical. Being Private candidate you are attending Theorical exam only . Still if you have any doubts plz give me your Subject Codes with name . HELP ME , WHAT DOES category OF PHYSICALLY HANDICAPPED means please help is there an errors ??? Mansi Private Candidates are’nt eligible for Project submission . You can only give Theory Exams and CBSE will evaluate according to your theory examination. Hardik You can try PRIVATE CBSE THROUGH CBSE PATRACHAR. koi farak nhi padta patrachar se 12th kerne se and yes you will get admission in any college. Yadi koi Student 12th Commerce stream se karata ha lekin vah fail ho jata ha, lekin ab vah art se 12th karana chahata ha to kya vo bhi private cbse addmission le sakata hai ya nahin. Kya use naya addmission lena hoga bina purane stream ko baraye.